This is a tool that I use literally on every single scout for commercial work where I need to plan out the locations I'm going to shoot based on time of day and where the light will be at anyone time. I tend to go to each of my locations (often after a scout has been there) and plan my shoot out based on the best time of day for each location. This is a great tool for photographer and filmmakers. The only thing you need to be careful about is that you need to stay away from metal when you use it as the compass can get fooled - ergo at times you can't use it accurately from a moving car... But if you need to line up a sunrise pretty darn well with a building or something the next morning (or further in the future) this is the app for you. 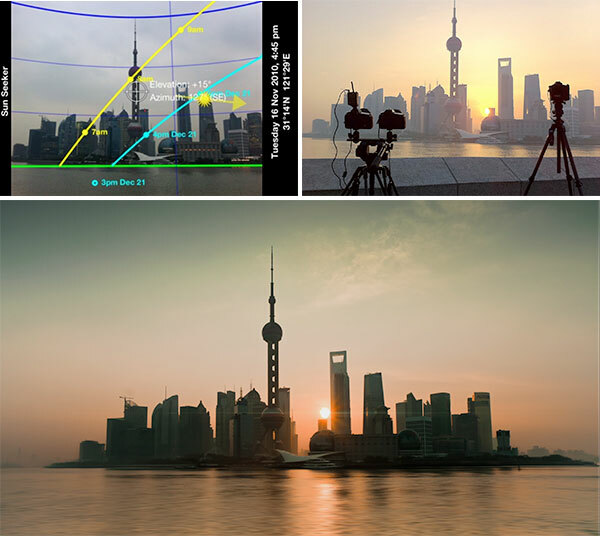 Below is a link to the app and an image from a scout I did in Shanghai and the resulting shot once I re-adjusted my position (to the left) to line up the sunrise the following morning. And the resulting video: https://vimeo.com/46133243.